Percussion music offers a rare chance for interactive hands-on learning experiences for a wide range of students and community members. 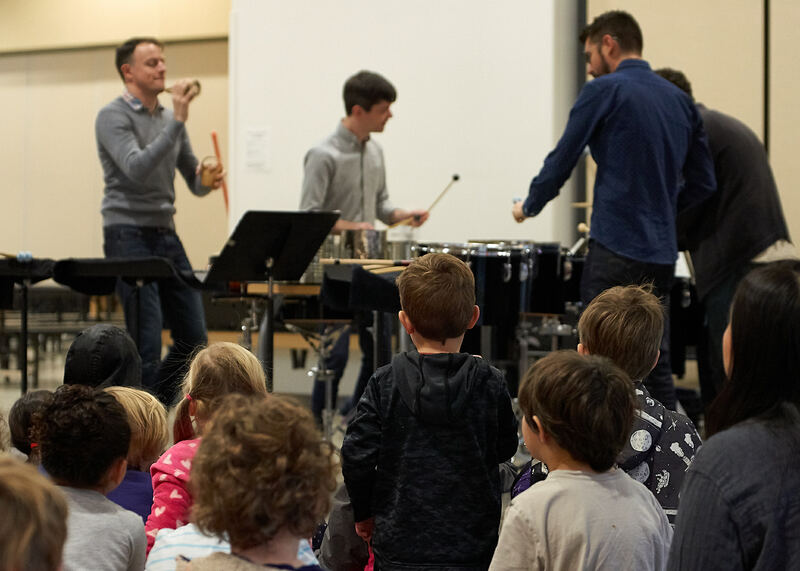 Third Coast Percussion offers a wide range of short-term residency activities that can be combined with any performance engagement. TCP offers interactive educational performances for all ages. Read more about our available programs, including our STEM to STEAM initiative – click here. An introduction to the music Third Coast performs and our careers as professional musicians. Master classes and solo and chamber music coaching for students on any instrument. TCP leads rehearsals and an informal performance of works including Terry Riley’s “In C” and John Luther Adams’s “Inuksuit.” Accessible for a wide range of musical skill levels. TCP shares insights into how the ensemble began, the teaching and gigging ensemble members did just after graduation until the ensemble became a full-time job, how the ensemble grew to become a full-time job, and more. TCP leads an audience through a rehearsal of our repertoire, addressing questions about the music, our rehearsal process, and more. Student composition readings and presentations on best practices and techniques when composing for percussion instruments. TCP is an artist-run ensemble. We can speak on topics including artistic planning, fund raising, finances, production, and more.